If you've been featured, don't forget to pick up the button at the bottom of the post! 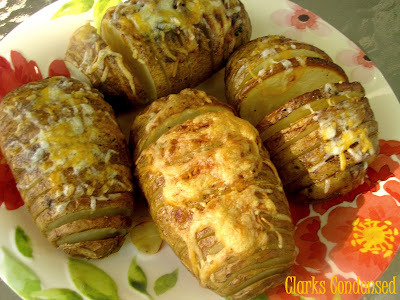 Last week we had an awesome guest post featuring a kids craft from A Mouse in My Kitchen and this week I'm happy to bring you a mouth-watering recipe for Ready-To-Eat Baked Potatoes from Katie over at Clark Condensed! Making me hungry just thinking about them! Scroll down to find out exactly what I mean by mouth-watering!! Hi everyone! 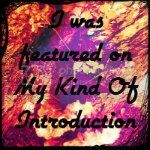 I'm thrilled to be posting here at My Kind of Introduction. My name is Katie, and I blog over at Clarks Condensed. If you like food, kids, saving money, and more...then come on over! The potato... One of the most basic staples of life, but also one of the most versatile. I grew up eating potatoes in all different forms -- fried, baked, mashed, twice baked...everything. Part of me attributes this to the fact that my mom is from Idaho, but really...I think it's because potatoes are just so delicious! So, one of my favorite ways to eat a potato is baked. I've always loved watching the butter melt onto a warm potato, and then piling on all the toppings my mom would put out -- cheese, sour cream, pepperonis (is that weird?! ), and green onions. It definitely wasn't something you wanted to eat if you were on a diet, but boy oh boy...I'm getting hungry thinking about it! Over the years, I've tried different ways to bake a potato, and I recently discovered my favorite way. This is SO easy, and the potato comes out of the oven ready to eat. You can totally customize it in anyway, and it's done in 40 minutes. Paired with a juicy roast or BBQ chicken, this is the perfect side dish. I present to you, the world's best baked potato. It's so easy to do and totally kid friendly. In fact, I bet any kid that loves to help in the kitchen would love to help make this. You can eat them plain, or add cheese, bacon, sour cream, or, if you're weird like me, pepperonis. The possibilities are endless, and once you try this, you may never go back to the traditional way of eating a baked potato again! Toppings of choice -- Suggestions: sour cream, cheese, basil, bacon, pepperonis, green onions, etc. Preheat oven to 350. Wash and dry potatoes, and place on a large cookie pan. Using a sharp knife, cut 1/2-inch thick slices almost completely through the potato, leaving about 1/2-inch attached at the bottom of the potato. Brush olive oil or coconut oil over the potato, making sure to brush the individual slices. Drizzle butter on top of potatoes, and season with salt and pepper. Place in oven and cook for 40 minutes, unless you want to add cheese, sour cream, or other toppings. If so, cook for 30 minutes and add additional toppings for remaining 10 minutes. Don't they look delicious?! How did you like this wonderful Guest Post Recipe from Clarks Condensed? Let us know below! Thanks for letting me me guest post today. I love the idea of wrapping it in aluminum foil! Thanks for the #GuestPost! I would love to work together again in the near future! I love blogs that have guest posts! What a wonderful way to support one another. I have never cut my potatoes before baking them. I bet the butter slathered in there keeps them nice and moist (and makes them extra delicious!). Might have to give this a try this weekend! I just recently started posting guest posts at the beginning of June (started collecting in May) and I love it! I agree supporting each other is what keeps us going. We're the only ones who truly knows what other bloggers are going through when it comes to work! Oh these do look tasty! I would also make them with gold potatoes. I can't wait to give these a try. The potato sounds great bit I'd do without the Mackerel :-D Potato's are my favorite veggie!!! Can't wait to try these, I haven't gotten the chance yet :( I will soon though! !